A Level Four risk of avalanches, the second-highest possible, has been declared for all of Svalbard on Tuesday, prompting a warning not to travel in any potential at-risk areas, although city officials said there is no apparent danger to buildings. The risk assessment was elevated one level Tuesday morning following heavy snow and winds exceeding 70 kilometers an hour Monday night and early Tuesday. 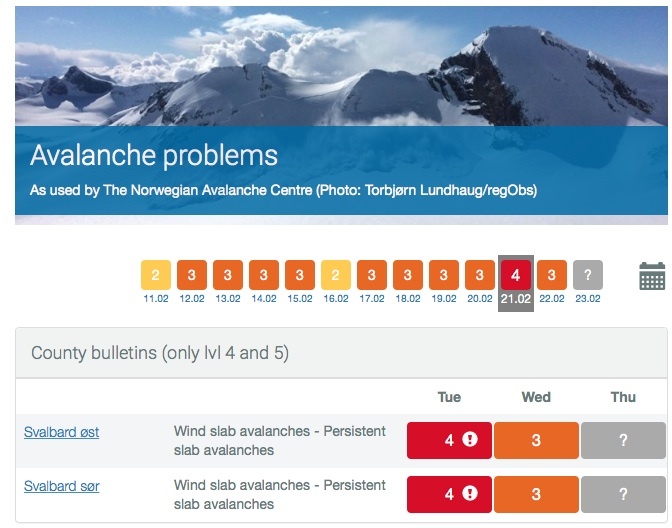 The Norwegian Avalanche Center’s monitoring website states all of Svalbard is at risk of wind slab avalanches. A return to a Level Three risk level is expected on Wednesday. The Governor of Svalbard reported no significant incidents as of Tuesday morning. Winds are expected to decrease throughout the day, and little or no snow is forecast for the next several days. Temperatures are expected to gradually drop to minus 24 degrees Celsius on Thursday before rapidly rising to several degrees below zero.